Happy Friday! 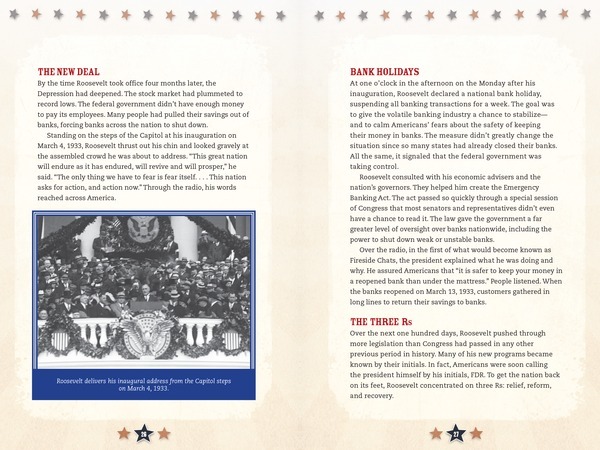 In honor of Presidents’ Day, we’re giving away the titles in our new four-book Presidential Powerhouses series. Each title in this series takes a look inside the professional and personal lives of some of America’s most influential presidents. Readers will investigate the key ideas behind their presidential platforms while running for office, analyze the policies they made while in office, and evaluate how they shaped and were shaped by history. Perfect timing! Our third graders are studying Franklin Roosevelt this month and would certainly benefit from this collection! Fantastic! Our school library is currently looking to update some of our presidential biographies. This series looks like a great addition. I love biographies would love to know what made these presidents tick! This looks like a great set for social studies instruction! I like the fact that these books examine many different aspects of the men who ruled our country. They will provide a resource when students are doing research on a president's personal lives all the way through to the platforms they ran on. Excellent resource for my social studies classes, and I love that they are suitable for grades 7 all the way through 12th grade. Thanks for the chance to use these.